This Saturday June 21 from 10:00 a.m. – 3:00 p.m., celebrate Pittsburgh’s passion for food at the third annual Hometown-Homegrown event at the Heinz History Center. Enjoy samples from dozens of local vendors at this fun and flavorful food expo. Presented in partnership with GoodTaste! Pittsburgh, Hometown-Homegrown will feature samples from nearly 40 local food vendors along with cooking demonstrations, live entertainment, kids activities, and more spanning all five floors of the History Center. Hometown-Homegrown activities are free with museum admission. For those of you who are PHCA members, you can get free admission for yourself and up to three other people. Just show your PHCA membership card at the entry desk and tell them that you’re a member of a History Center affiliate organization. Click here for more information and details about this year’s vendors. The PHCA bylaws committee has been meeting since June 2012 to discuss revisions to the bylaws to make them more clear and applicable to how the organization currently operates. The bylaws committee is made up of Janice Heagy (committee chair), Alexis Miller (PHCA president), Josiah Parkinson (board member), Tom Ogden (board member), and John Rhoades (subscription member). The committee also received assistance and advice from the Community Technical Assistance Center. Here is a summary of the proposed revisions, and here is the full document, showing the original text and the proposed revisions. Bylaw revisions were presented at the membership meeting on October 2, 2012. Copies of the changes are also available at the PHCA office and are available for viewing anytime during office hours, 10 – 6, Tuesday through Saturday. Bylaw revisions are grouped into 12 groups of revisions, one for each article that has a change. Each of the 12 groups will be voted on separately. Voting of the bylaw revisions will take place at the next membership meeting, Wednesday, November 7, 2012. Only current regular members (those who live in Polish Hill) and present at the November membership meeting will be eligible to vote on the bylaw amendments. Regular members are also welcome to make motions for other changes to the bylaws. If the member-initiated revisions need more discussion or research, it will be voted on at a future membership meeting separately from the revisions laid forth here. The bylaws are a living document and can be revised at any time as long as the revision is approved by the PHCA membership. It is the intention of the PHCA to review the bylaws annually going forward. Above: one of the proposed revisions to the bylaws is that the name of the association be revised to match common usage, Polish Hill Civic Association. 1. A bylaws committee has been meeting since June 2012 to discuss revisions to the bylaws to make them more clear and applicable to how the organization currently operates. The following revisions are being recommended by the bylaws committee. The bylaws committee is made up of Janice Heagy (committee chair), Alexis Miller (PHCA president), Josiah Parkinson (board member), Tom Ogden (board member), and John Rhoades (subscription member) and received assistance from Community Technical Assistance Center. 2. Bylaw revisions will be presented to membership by the bylaws committee at the membership meeting on October 2, 2012. Copies of the changes are also available at the PHCA office and on our website www.phcapgh.org . 3. Bylaw revisions are grouped into 12 groups of revisions, one for each article that has a change. Each of the 12 groups will be voted on separately. 4. Voting of the bylaw revisions will take place at the next membership meeting, on Wednesday, November 7, 2012. Only members who are paid for calendar year 2012 and present at the November membership meeting will be eligible to vote on the bylaw amendments. Members are also welcome to make motions for other changes to the bylaws. If the member-initiated revisions need more discussion or research, it will be voted on at a future membership meeting separately from the revisions laid forth here. 5. The bylaws are a living document and can be revised at any time as long as the revision is approved by the PHCA membership. It is the intention of the PHCA to review the bylaws annually going forward. The contributions Ann Davis made to Polish Hill will never be forgotten. Ann was one of the Founders of our Neighborhood Group, the Polish Hill Civic Association, She served as President of our group for many years. In reading the first book of minutes from the beginnings of the PHCA Ann suggested that Polish Hill should have a newsletter. In all the capacities that Ann was of service to our Neighborhood, she will be remembered as an advocate and a voice for Polish Hill. She always had the best intentions for Polish Hill. Ann will be missed, but she will not be forgotten. Our most heart felt condolences go out to all the family and close friends Ann left behind. In lieu of flowers Ann’s family has asked that donations be made to Immaculate Heart of Mary Church for the repairs needed on the domes. As past president of the Polish Hill Civic Association and an activist beyond that, she helped develop senior housing, improve recreational opportunities, enhance safety, support the neighborhood’s cornerstone church and lend a hand to countless other projects. In her 90s, she was still joining other neighborhood representatives in zoning hearings Downtown to make sure their voices counted on key proposals. Read the entire article. Friends and relatives will be received from noon to 4 and 6 to 9 p.m. Monday and Tuesday at the WALTER J. ZALEWSKI FUNERAL HOME, 216 44th St., Lawrenceville. Funeral Mass will be celebrated at 10 a.m. Wednesday in Immaculate Heart of Mary Church. Family requests donations to the Immaculate Heart of Mary Church Dome Fund. 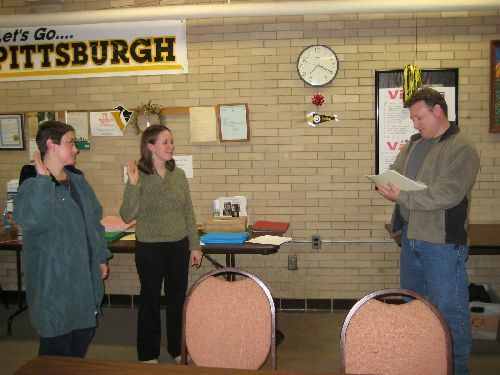 Catherine McConnell, Vice President, swears in PHCA’s President, Terry Doloughty. A special welcome to the Board’s newest members, Alexis Miller and Tom Ogden. Ms. Miler is filling the post of Board Secretary and Tom Ogden is filling a Directorship. Ladies and Gentlemen of the Board, thank you for all of your effort on behalf of the PHCA and the Polish Hill neighborhood. PHCA looks forward with great expectation for the next year. Join us on Tuesday, June 3, 2008 @6:30 p.m.